Kulanjan - Alpinia galanga Wild Linn - Siamese Ginger Anti-microbial Property. Anti-tumour activity. Anti-ulcer activity. Anabolic effects. Anti-hepatotoxic effect. Useful in various lipid disorders especially atherosclerosis. It has Anti-microbial Property, Anti-tumour activity, Anti-ulcer activity, Anabolic effects, Anti-hepatotoxic effect, Useful in various lipid disorders especially atherosclerosis. 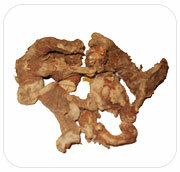 The rhizome is used against rheumatism, bronchial catarrh, bad breath and ulcers whooping colds in children, throat infections, to control incontinence and fever. Alpinia species show promise as anti-fungals, hypotensives, enhancers of sperm count and motility. Anti-tumor and anti-dementia effects have been observed in rodents. Used in dyspepsia, fevers, incontinence of urine and also advocated in diabetes mellitus and said to diminish quantity of urine.